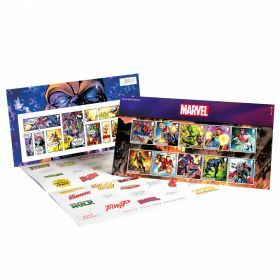 This A4-sized collector sheet contains each of the 10 Marvel Super Hero stamps in self-adhesive format. 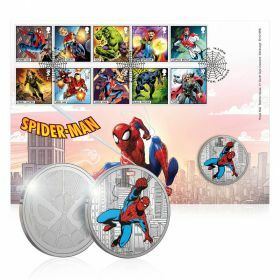 As an added bonus, alongside each stamp is a sticker featuring a classic comic book moment for all 10 characters. scape with the iconic Stark Tower in the foreground. 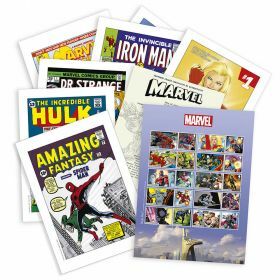 A4-sized collector sheet contains each of the 10 Marvel Super Hero stamps in self-adhesive format. 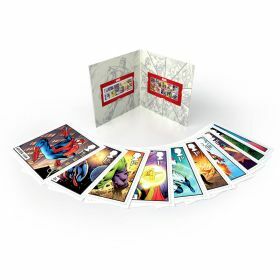 As an added bonus, alongside each stamp is a sticker featuring a classic comic book moment for all 10 characters. Forming the background to this stunning display is a striking city scape with the iconic Stark Tower in the foreground.